One frequent complaint I hear from gardeners is the bad luck they have with getting carrots to grow. Often they mention that it hardly seems worth it since only a few seeds sprout and they end up with just a couple of carrots in the row. The problem can be traced back to improper planting; specifically sowing the seed too deeply. Carrot seeds are fairly small and need to be placed near the surface of the soil in order to sprout. You need to resist the urge to “dig a hole and cover the seed with dirt”. All that is needed by carrot seeds is a very shallow row scratched into the surface of a smooth area of your garden. Place the seed into the row and cover with a little bit of sand, I would say less than 1/4 “. The sand covers the seed without “smothering” it. This is especially helpful in gardens with heavy dense soil with a high clay content. Carrot seeds covered with a shallow layer of sand. Carrot seeds are most commonly sold as bare seeds but sometimes can be found as “pelleted” seeds. The pelleting process deposits a layer of clay onto the seeds to help them pass through a garden seeder easier. It also makes it easier to see the seeds in your garden when planting them. Pelleting can give you a false sense of security since the seeds appear larger you think you can plant them deeper. Raw carrot seeds on the left and pelleted carrot seeds on the right. Keep the carrot area moist until the seedlings emerge from the soil which can take from 1 to 3 weeks. After that be sure to remove any weeds before they get too big because the young carrots won’t compete well against large weeds. Sow carrots seeds shallowly and you will have a much better chance of harvesting a bountiful carrot crop this year. I’ve debated on whether or not chickens should be included in discussions about gardening. Judy and I are into our 4th year of keeping chickens and have a current flock of 88 including laying hens and young pullets as well as cockerels for meat. 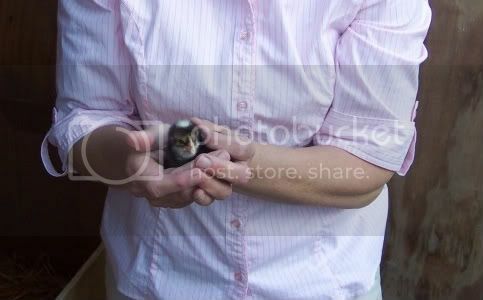 Judy holding one of our new chicks. Back when I was an Agriculture Agent decades ago, the answer to the chicken/garden question was pretty simple: no, chickens are classified as small livestock, not garden produce. This is the assumption I have been working under with this blog and so, have not discussed poultry at all. Times have changed and so many people have asked me about chickens that I have decided on a compromise. I will discuss raising backyard chickens in another forum and not try to do so at length here in “All things green”. I plan to post a short blurb here when there is something of interest on our other site regarding poultry related issues. So if you are intrigued by poultry at all, you may want to check out Yellow Farmhouse Garden. You can follow the development of our 50 baby chicks as they grow, sort of like Jim Carry’s movie “The Truman Show“. Right now you can see episode #1. 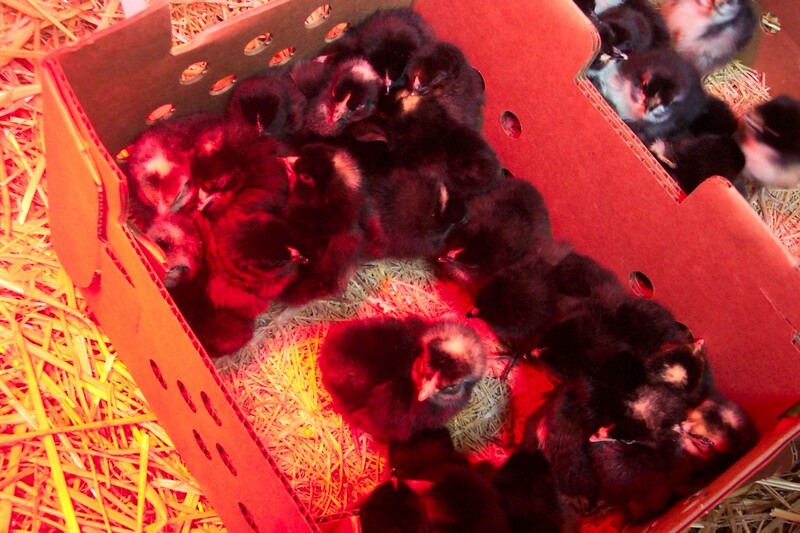 We received our 50 newly hatched chicks back on April 15, tax day. I got a call from our local post office letting me know that I needed to come in to pick them up. 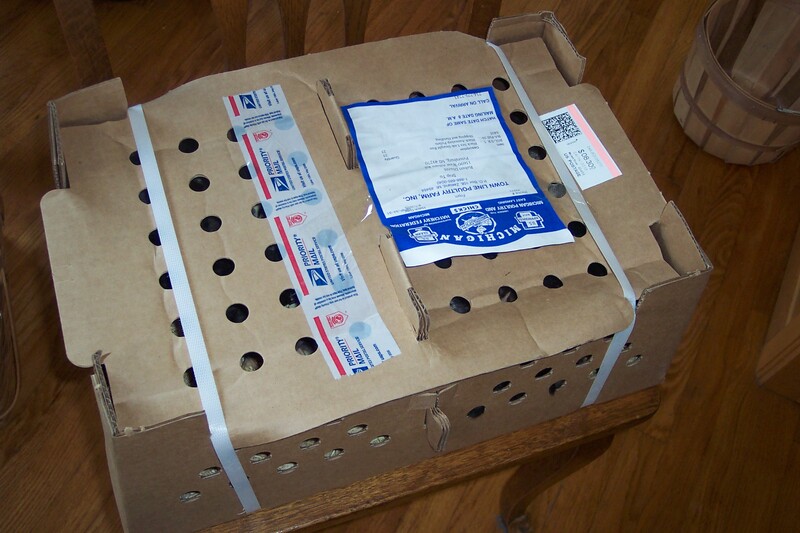 Chicks are shipped in special crates designed to keep them in good shape during transit. Ours came from Town Line Poultry Farm and arrived in tip top shape. 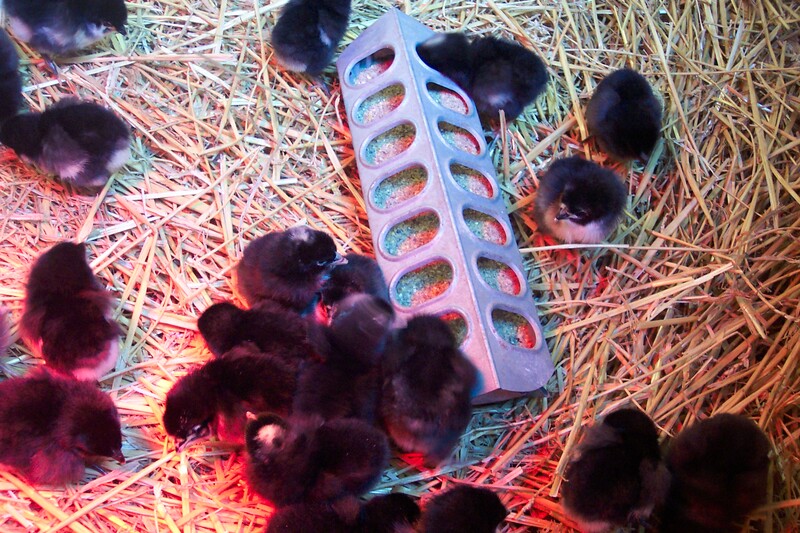 This box holds 50 chicks and has a divider down the middle separating the chicks into two areas, each holding 25 chicks. 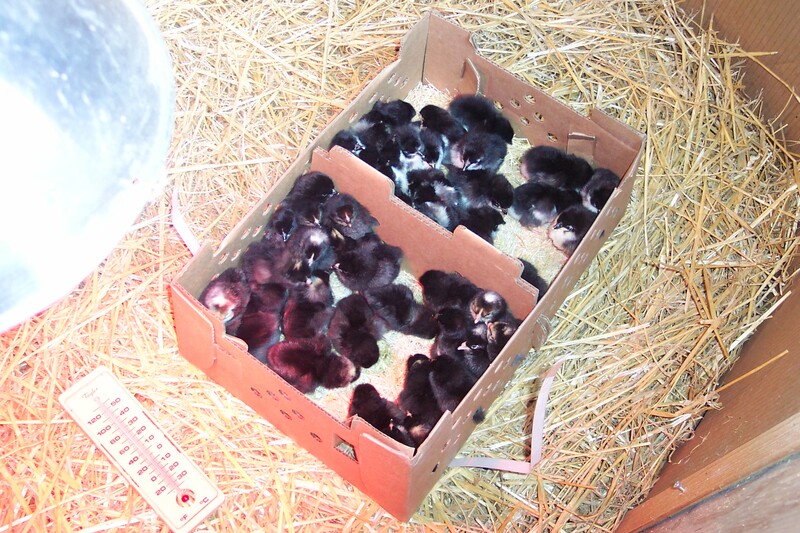 It doesn’t look like it but there are fifty chicks in that box. 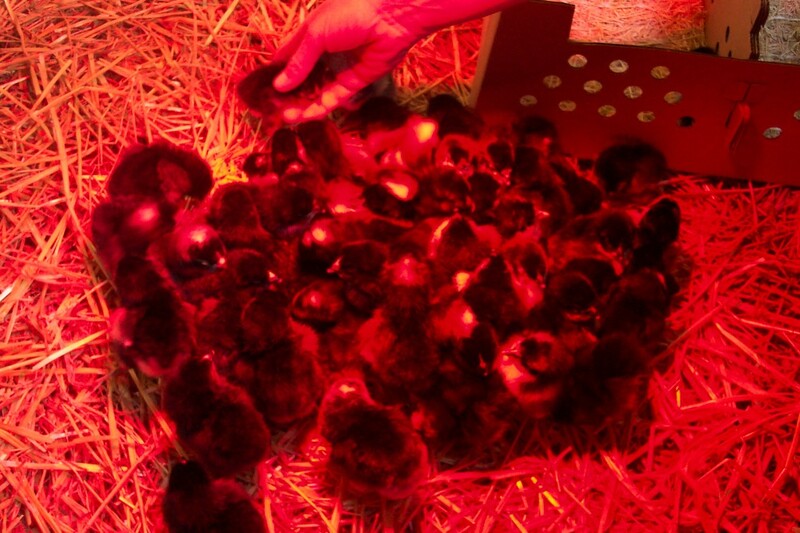 The next order of business was to place them into the brooder. 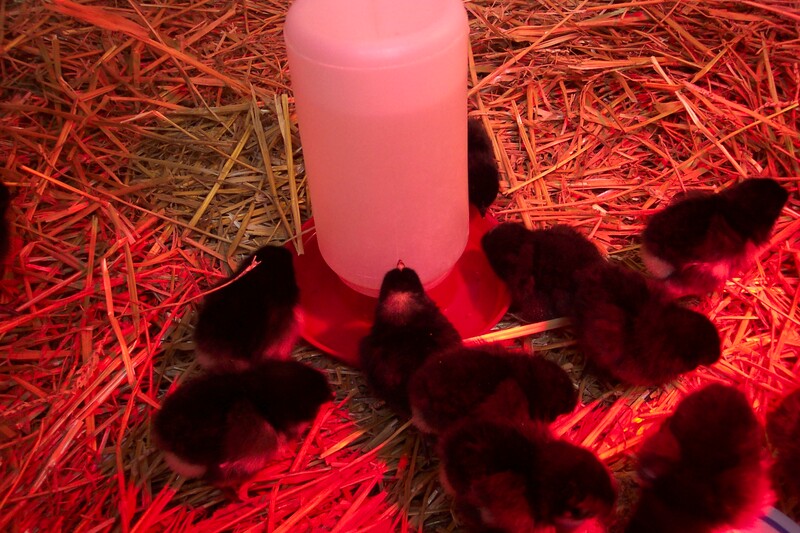 A brooder is a heated area, safe from predators, where the chicks can begin to grow. 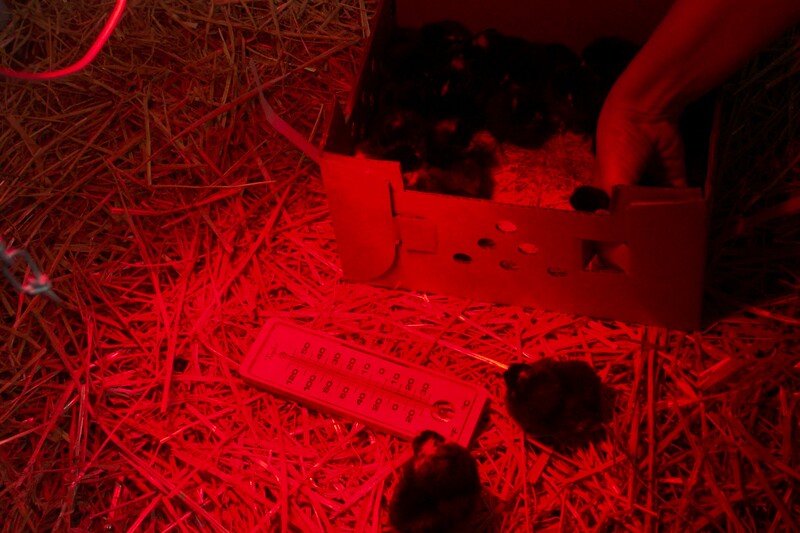 We turned on the red heat-lamp which gives off plenty of radiant heat too keep the chicks at their critical temperature of 95 F.
We didn’t just dump them out like a box of toys but rather carefully took them out and set them down onto the brooder floor. We made sure a thermometer was inside so we could monitor the temperature. We made sure the chicks had plenty of the proper food. They also needed clean water. It’s really amazing how they know how to eat and drink without being shown how. After all, they are essentially orphans with no mother hen to teach them what to do. Next time we’ll talk a little bit about feed requirements for baby chicks. We have arrived at the middle of May and that signals the beginning of the main part of our gardening season here in Southeastern Michigan. According to records kept by the National Weather Service, the chance of a late spring frost happening at this time of the year is around 10% in the Monroe County Area. NOAA has developed this map to show the chance of temperatures reaching 32 degrees or lower. I know that even in the northern part of the Lower Peninsula gardeners are thinking pretty seriously about setting out plants even though it is fairly common to get a frost as late as the end of May in their neck of the woods. The Upper Peninsula is another story. For example at Tahquamenon Falls or other places in the UP like the small town of Herman there is still a 10% chance that the temperature will get down to 32 degrees as late as July 11th. Anyone who has camped out at Tahquamenon Falls State Park can tell you that it can get pretty chilly there in the morning. For us “trolls” living below the bridge, it is time to get busy gardening.